I once asked a Wall Street business man known for his ruthlessness with his staff, why he donated his time to girls scout and money to institutions for terminally ill? He said he was doing his bit to give back. When I noticed that one of my ex-bosses was extremely generous during the holiday season with the cafeteria staff who served us, I asked her the reason behind her generosity. She told me to watch the events during after hour business receptions and dinner parties hosted in the office. Sure enough, the staff would be all around her, favoring her with best seating arrangement, asking her even before her drink in hand was over what she would have next and so on. At least she was honest and was clear about her motives. One of our very own special sadhaka, Krishnadasji, who has been a high school teacher in the US narrated this story. He taught at a public high school, which was once visited by a senior supervisor. After checking out several classes and teachers in action, he requested Krishnadasji and one of his young colleague teachers, Ms. Anna, to provide him with names of 5 underprivileged students from each of their classes. He said he believed in and practiced the philosophy of “Vasudhaiva Kutumbakam” which means that whole world is my family. He took these kids on a tour of Manhattan city and the kids came back very happy, raving about the supervisor. Ms Anna was smitten by this act of kindness and discussed with Krishnadasji how she was truly impressed by his generosity. She eventually started dating the supervisor and then came the day when they decided to tie the knot. She once again shared her joy with Krishnadasji who advised her to see things as they were before making life’s critical decision. She shared that he had showered all his kindness and love on her through plenty of nice gifts and she was quite sure about her decision. After 2 years of marital bliss, Ms. Anna shared the news of her pregnancy with her husband. She was distressed to hear that he did want the child and asked her to go for an abortion. She pleaded to no avail. Finally she shared her sorrow with Krishnadasji. He agreed to meet with her husband along with her parents for an open conversation. Krishnadasji our true angel was simply point blank and asked her husband what happened to his philosophy of Vasudhaiva Kutumbakam, when it came to his own child? It eventually came to light that he did not want his wife to have kids lest she lost her beauty!! Most of us are no different from the Wall Street business man, the ex-boss or Anna and her husband. We tend to live in silos; doing our “good” for the society, allocating time for bhakti, etc. In our everyday lives, however, we continue to be driven by our flawed perceptions; marred by fear, attachment, pride, and our endless desires. We may not even be aware of our own sub-conscious drivers for our behaviors and actions! It is only when we start breaking down this silo mentality and begin applying the principles of kindness, generosity, and sacrifice to our everyday ordinary actions and interactions with our family, friends, colleagues, teams and partners alike that we would have taken the first step to knowing ourselves. So why do I need to know myself? Its only when we really know ourselves will we start seeing the shades of black, grey and white in the fabric of our own lives. We may struggle to accept ourselves for who we are in the beginning but it’s a struggle worth undertaking. Once we are able to dive into it, we will eventually see the definition of “I” expanding because the same shades are present within and without just in varying patterns. Well if we can only easily cater to the “I”, can we really go beyond it? Acharyaji says there is no need to go beyond the I! We just need to slowly start expanding our definition of “I”. Lets start small by including our loved ones and anyone else we have called “my” or “mine”. I thank my guru, Acharyaji for his blessings and guidance through whom I am able to see a new day everyday! The daunting failures in my attempt to practice his divine teachings only drive me each day to start all over again. 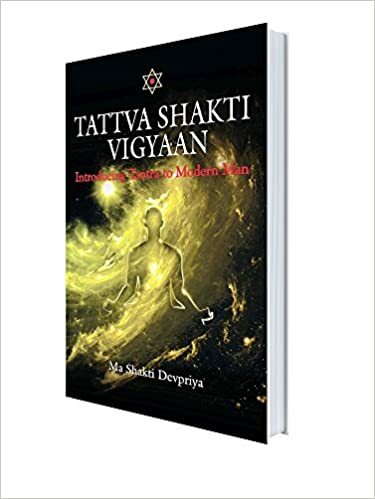 This article has been contributed by Jhankhna Verma, a dedicated Tattva Shakti Vigyaan practitioner from New Jersey US under the guidance of Guruma Shakti Devpriya & Acharya Agyaatadarshan Anand Nath ji. Jhankhna is a Yoga enthusiast & has deep interest in the field of ancient Healing Systems. As I read this quote by Gandhiji, I get a deeper insight into what made Gandhiji undefeatable and unstoppable by the most sophisticated army and artillery the then leading nation of the world, Britain, could afford. How can we live by this mantra? The first thing that comes to mind is we would have to drop the very notion of being judgmental! The question that comes up is how is judge-mentalism different from discernment or knowing when not to play with fire. One would easily argue, I cannot leave my jewelry collection with someone who has been labeled as thief. Which means, now I have to also drop my own attachments, fears and ego so that I can discern without feeding the fire? Exactly, and it worked for Gandhiji. His non-judgmental demeanor supported by fearlessness, humility and little attachment to the outcome of his endeavors is what gave us the most unimaginable outcome. He proved to the world that by being judgmental we are limiting our own choices, capabilities and unfathomable victories for self. So far, the world has been focusing on how by judging others we are unleashing an unfair disadvantage to those we judge. While that is the obvious truth, in order to really adopt this non-judgmental demeanor, we need to get a bit selfish first. What’s in it for me to not be judgmental? If we try to understand just one example of Gandhiji’s life and his achievements it will be obvious that by being judgmental we are first hurting ourselves in the process. By letting our judge mentalism drive our actions we choose to deal with the familiar terrain that is oh so pleasantly comforting and we also choose to go in circles in the same place forever! We build a boundary around ourselves- “a circle of trust” and choose to live within our self-imposed prison of limits. Anyone who does not abide by my rules, definitions, expectations, etc etc shall be judged! But that’s when start losing out on opportunities along with self growth that our ego, in fear of being hurt and defeated, cannot even fathom. Let’s break the invisible shackles and step out of that comfort zone sacrificing our attachment to “pleasantness” and embrace simply being there!!! This article has been contributed by Jhankhna Verma, a dedicated Tattva Shakti Vigyaan practitioner from New Jersey USA. Jhankhna is a Yoga enthusiast & has deep interest in the field of ancient Healing Systems. Guru’s often beseech their disciples to have immense patience on the path of self realization. Faith in Guru and patience in practice eventually lead the to glorious dawn which every seeker strives towards. It is ironical, however, that the same disciples test the patience of their masters in intended and unintended ways! The great saint Rajjab rung eloquent when he saw his disciple, who once resolved to be a celibate his entire life, sitting on a mare and about to proceed to meet her bride to be. The saint, quite exasperated, almost rushed to his disciple’s place and addressed him thus! It is said that the disciple immediately realised his destiny at these words of his master, flung himself down from the horse and fell on the lotus feet of his master, to remain in his communion forever. But the saint had already had a dramatic day! Think of the immense consternation which Kabir would have faced when he left his mortal body. Kabir preached the unity of religions his entire life, only to find the Hindu and Muslim disciples squabbling over whether to bury or cremate his body! Legends say when the body was uncovered, there were just a few flowers, which needed neither burial nor cremation. The last tale is the untold story of my Gurus, Ma Shakti Devpriya and Acharya Agyaatdarshan! In this age, deeply steeped in materialism, they patiently guide their disciples from ruin to glory. I have seen AD’s words becoming more strident for his disciples. From “do whatever little you can” to his latest exhortation of “Udyamo Bhairavah – put forth all your enterprise to become Shiva” during his interpretation of Shiv Sutras, the paradigm he shifted for his disciples! Patiently waiting for their disciples to understand the wisdom in their words, they have stood by their disciples through the ordeals with the material and the spirit. While I can only surmise how I might have tested their patience over the years, I bow to them in reverence and beseech them to be more direct, open and critical towards this wavering disciple of theirs!